A mollusk that is one of the two classes of shellfish that develops two separate shells used for swimming. Referred to as a bivalve mollusk, the shells are opened and closed repeatedly to create propulsion for swimming. 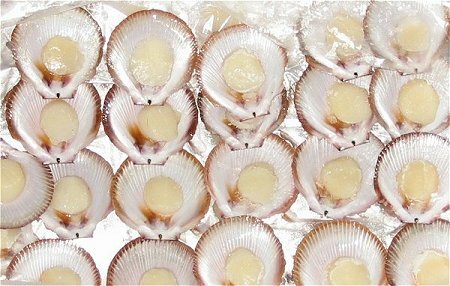 By swimming in this manner, the mollusk develops a large size muscle that becomes the part of the scallop that is eaten. The meat of a scallop is round in shape and has a mildly sweet, delicate taste and creamy texture. 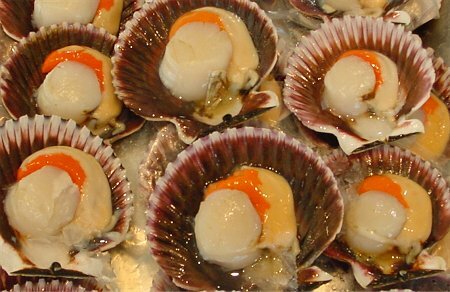 Scallops are available in three varieties: sea scallops, bay scallops or calico scallops. The sea scallops, which are most readily available in the Atlantic waters of the U.S., grow to a length of two inches in diameter, providing a tender meat that is slightly less sweet than the bay scallop. The bay scallop, which also comes from the Atlantic grows to about one half inch in diameter and is harder to find but is more tender and a little sweeter tasting than sea or calico scallops. The waters of the Gulf of Mexico produce the calico scallops are generally less than a half inch in diameter and may be sold as a bay scallop, since they look similar. Calico scallops are not as flavorful nor as sweet as the bay or sea scallops. Scallops can be prepared using a variety of methods, such as broiling, baking and grilling. Scallops with Broccoli and Rosemary Sauce - Sea Scallops, rosemary, broccoli, garlic and Italian style tomatoes. Portuguese Style Scallops - Sea scallops with port wine, garlic, lemon and parsley served over rice. Scallop Stir Fry - Sea scallops, broccoli, garlic mushrooms, onions, snow peas with Asian sauce. Sea Scallops with Capsicum and Zucchini - Sea scallops, red capsicum, zucchini, garlic, thyme, Pernod, lemon juice and parsley.